Back in 2015, I discovered Sufjan Stevens’ marvelous music. “Abraham” moved me deeply. The simple music played on acoustic guitar accompanying spare and fine, almost stark, lyrics is surely mystical. The type is Isaac, bound with the killing thrust poised in Abraham’s hand. 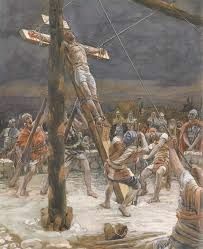 The antitype is Jesus, nailed to a cross with the killing nails. Slow, inch by inch, life leaked from Jesus’ hands. The angel stayed Isaac’s execution. Not so, Jesus. What God did not ultimately demand of Abraham, He did demand of Himself. On that Friday of death, contradiction morphed into paradox: Good Friday. This young man got more than he expected on that Good Friday hunt. He became a priest and then a bishop and followed Jesus as a hunter of souls all because the Holy One went hunting for Hubert’s soul on a Good Friday. Esau was a hairy man’s man – a mighty hunter (if you will pardon me) a bubba – with gun-racks (or in this case bow-racks) on the side of his chariot. Jacob was a momma’s boy – staying at home reading cook books, while there is nothing wrong with cooking and many of the great chefs are male, the little brother has not yet begun to move from the nurture of childhood into the journey toward man-hood. Esau and Jacob are the twin issues of men not leaving home and not growing up AND leavening home but not growing up either. Esau comes home down and very hungry from a hunt having bagged nothing. Jacob has cooked up a pot of red lentils which must have smelled better than I imagine, so he says he’s dying can he have some of the, literally, red-red stuff. Jacob says sure big brother, it’s yours if you will give me the birth-right making me the eldest of the two of us and the heir. So Bubba did it despising his birth-right. Esau could read the signs in the field but he could not discern the signs in his own life, does not connect to the deepest issues of his heart. In this we, especially men, are the sons of Esau who sell our treasure without considering its value. 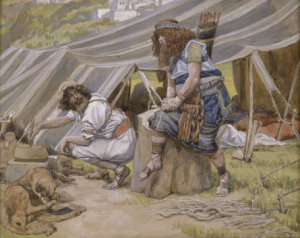 The twin’s grand-father, Abraham, was a great hunter. 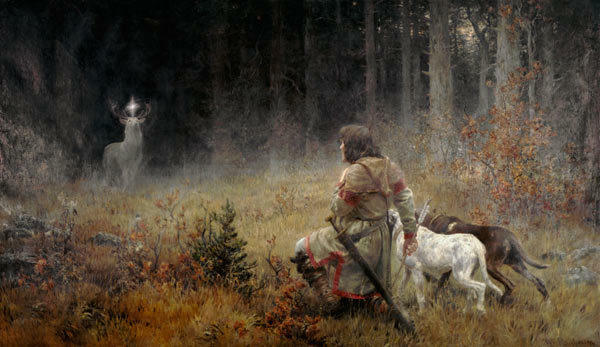 Although there is no mention of his hunting game – he stalked a greater prize – a country promised by God. Leaving everything hunting the place God promised. By faith he left home not knowing where he was going – and he went. Faith is the evidence of things not seen – Abraham is the type of this for believers ever since – today the religions count him as their spiritual ancestor. Abraham is the grand-father of hunters and from him the lore and the art of spiritual hunting is our legacy and our inheritance. What are we hunting when we go hunting and who is hunting us when we go hunting? Hunting is a metaphor for growing up and going on adventure – the goal being maturity and wholeness. Jesus is God’s best and most complete attempt to come and hunt so that we and all who have ever lived and ever will live may be saved. After all, he said he came to seek and to save that which was lost. He of course tended to bring them back alive as he told the fishermen by the lake, “come and follow me and I will make you fishers of men;” of course he could just as easily told a party of hunters to follow him and he would make them hunters of men. The shadow is always present but also there the tradition of feeding families and doing it carefully, humanely and respectfully. Prayer and hunting have always go together because one dies on this planet to nourish the life of another. I have been taken to task about hunting by some who live by vegetables alone. My response, “Do you not realize that broccoli screams at being pulled up by the roots? Something always ends in order others to begin or continue. In addition Hunting became a powerful metaphor in religion. • This hunting metaphor becomes the metaphor of evangelism. • While hunting and feeding on the animal becomes the language of sacrament, “behold the lamb of God that takes away the sins of the world” AND Jesus’ admonition, “eat my body and drink my blood” has been practiced by Christians ever since. In matters of faith as in nutrition you are what you eat. In today’s Gospel, Jesus is passing through Jericho, the oldest continuous human settlement on the planet. Here the trade routes from Africa, Asia and Europe intersect. And wherever the trade goes the tax-collector follows. Rome said, “Come and follow me and I will make your taxers of men.” Tax-collecting was a franchise with a stated amount required by the state, whatever else the tax-man could squeeze out of the traffic was his to keep; and trust me they could squeeze quite a lot – Zacchaeus was the head-taxer and therefore filthy rich. Somehow, Zac knew that Jesus was coming. So he went out hunting that morning. He didn’t have too far to go from his home in the gated community, the bombing incident had been some years back but any scalawag worth salt knows you have to keep your eyes open. Parking, he walked down into the crowds. Apparently, this Jesus draws a crowd. He goes out to see Jesus and he is a little man so the crowd no doubt made sure he couldn’t see (the sort of petty revenge taken by the weak on the powerful). But Zac didn’t get where he was because of his dignity or passivity so he shinnied up a sycamore tree. As Jesus came along he looked up and realized that he has treed something important or this case someone. 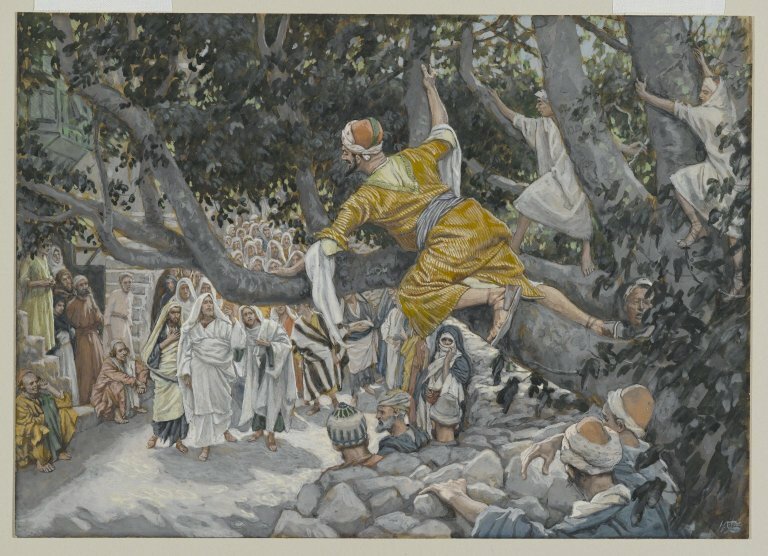 Jesus said, “Zacchaeus, come on down, I’m inviting myself and a bunch of my closest friends to lunch.” The text doesn’t record the reaction of Mrs. Zacchaeus when her husband showed up with all those strangers. After lunch, Zacchaeus – I will give half of all I have to the poor and if I have defrauded anyone [of course he had], I will pay them four times as much. When you are hunted and treed by Jesus things change and they change for the better. In 1492 Columbus set sail to the west to find the orient only to run into the Americas, and in that case for the explorer, as the tax-collector in Jericho, what he found turned out to be better than what he was looking for. 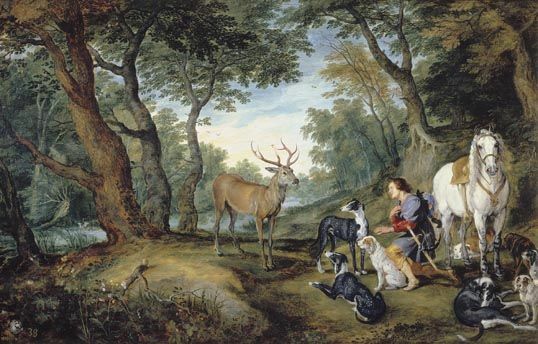 Saint Hubert heard the call of God and laid down his bow and took the hunt for souls, even as Jesus called the disciples. Let us seek God knowing that we find be found by Him and know that he sent his Son so that we might be Brought back alive – in fact more alive than we have ever been before – to have life and that life abundantly; may that be the ultimate concern of all hunting. The rich man is usually called Dives (Latin for wealthy). He was so rich that he wore purple, which was so expensive that only the Emperor had an entire garment dyed purple. The wealthy had a stripe or two on their clothing. He also wore linen from Egypt which was so fine that it was worn by those who did nothing much all day. Lazarus longed to eat those mangled pieces of bread but he didn’t get them. The dogs, however, took pity on him and licked his sores. There is no evidence that the rich man was mean to Lazarus. Apparently he didn’t think about him one way or another. Both men died and were buried. 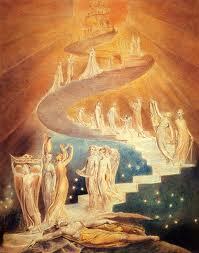 The rich man went to Hades [the place of the dead], while Lazarus went to Paradise. Apparently these “places” are in sight of each other. In Paradise Abraham presides at a feast where Lazarus is the guest of honor. The rich man saw the festivities from his place of torment in Hades. Notice that even in Hades the rich man is still trying to order people around. Abraham: “They have Moses and the Prophets.”Rich man: “No, if someone comes to them from the dead they will listen.” Abraham: “If they don’t listen to Moses and the Prophets they will not be convinced if one comes to them from the dead. WHAT DID THE RICH MAN LACK? 1. CONSCIOUSNESS: It is the nature of sin that We are stuck on ourselves and unaware of what goes on around us. We look fine to us, when we are really asleep/unconscious. The truth is that all people are more alike than they are different, but we spend a lot of time, energy, and advertising money convincing ourselves otherwise. When we are conscious we read the situation not just for facts but also with wisdom like the village idiot who was stopped every day by the townspeople and asked to pick between a nickel and a dime. The idiot always chose the nickel and the residents went away saying, “There, you see what an idiot he is.” Except that the idiot in later life explained: “After all, if I kept picking the dime, they would have stopped offering it to me. This way I kept getting nickels every day.” Wake up and read the signs. is back in the bad or good ole days depending on your perspective before husbands are in the room armed with digital cameras recording this birth as if it is the only birth to ever occur on this planet. So we cannot trust our eyes blinded like Dives to the poor at our own gates while our dogs know and minister to the very ones we look through as we drive to and fro. Indeed we cannot trust our eyes for the lens of our imagination is badly out of focus and there is a certain fuzziness to reality. • “If I had my life to live over, I would love more. I would especially love others more. • I would let this love express itself in a concern for my neighbors, my friends, and all with whom I come in contact. • I would try to let love permeate me, overcome me, overwhelm me and direct me. • I would love the unlovely, the unwanted, the unknown, and the unloved. • I would give more. I would learn early in life the joy of giving, the pleasure of sharing and the happiness of helping. • I would give more than money; I would give some of life’s treasured possessions, such as time, thoughts and kind words. • If I had my life to live over, I would be much more unconventional, because where society overlooks people, I would socialize with them. • Where custom acknowledges peers as best, with whom to have fellowship, I would want some non-peer friends. • Where tradition stratifies people because of economics, education, race, or religion, I would want fellowship with friends in all strata. • And I would choose to go where the crowd doesn’t go, where the road is not paved, where the weather is bitter, where friends are few, where the need is great … and where God is most likely to be found. 4. SENSE OF SPIRITUAL REALITY: The world tends to believe that the rich are rich because God likes them better than others. However the Gospel tells us that earthly success does not equal salvation. The life and teaching of Jesus proclaims that the Kingdom of God is not about success as the world calculates such things. Robert Farrar Capon, “The Parables of Grace” …if the world could have been saved by successful living, it would have been tidied up long ago. Certainly, the successful livers of this world have always been ready enough to stuff life’s losers into the garbage can of history. Their program for turning earth back into Eden has consistently been to shun the sick, to lock the poor in ghettos, to disenfranchise those whose skin was the wrong color, and to exterminate those whose religion was inconvenient. … But for all of that Eden has never returned. The world’s woes are beyond repair by the world’s successes: there are just too many failures, and they come to thick and fast for any program, however energetic or well-funded. Dives, for all his purple, fine linen and faring sumptuously, dies not one whit less dead than Lazarus. And before he dies, his wealth no more guarantees him health or happiness than it does exemption from death. Therefore when the Gospel is proclaimed, it stays light-years away from reliance on success or on any other exercise of right-handed power. Instead, it relies resolutely on left-handed power – on the power that, in mystery, works through failure, loss, and death. This is hard for us to hear. We are weaned on the notion that WE are in charge of our destiny. Jesus has come to break the good news to us that this is not so. He requires not our success but our trust. Abraham always said, “Here am I”, when God called. He had said yes when God called him to abandon all that he had known and to follow him into a land and a future and a promise. Abraham had to be terrified. It had to be the worst nightmare any person could imagine. God told him to go into the land promised to him: And he went. God promised to make him the Father of a great nation: And he went. God told him that after years of childlessness, Sarah would have a son: Isaac (laughter). And he was born. Simply to reject God and His command which would mark the end of the covenant. To sacrifice his only remaining son to a God whose will he can no longer comprehend, would also negate the dream Abraham has journeyed toward for so long. On the way to Moriah, the dream may not have died, but it was certainly not the same. And then at the last minute, the angel of the Lord stopped his hand. We have just begun the yearly remembering that Good Friday (I read recently that originally it was called ‘God Friday”) which is certainly true and what God did that day was indeed good, in consequence if not in method. That remembering must go outside the reality we understand, situated as we are in time and space. The sacrifice of the Son, Second Person of the Trinity happened before the “foundation of the world” before Creation. Then in time and space, the only Son of God was born among us, fully human and fully God, died on the Cross in time and space for our sake. Early, I suspect within days if not hours of the resurrection, someone said, “I’ve been thinking, “the story of Father Abraham, blessed be he, binding Father Isaac, blessed be he, is a type, a pre-figuring of what just happened to Rabbi Jesus. Someone else interrupted, “The Holy One, Our Lord called Father, allowed the sacrifice of his son. God did that thing from which he prevented Father Abraham. That is why this lesson is read on Good Friday. Christians have come to see in the story of the old man and his son on the summit of Mount Moriah, the place where the temple stood, a prefiguring of the sacrifice of Jesus on a nearby hill. The mystery of faith is “How can this be?” How can it be, that God could love humanity so much that He demanded of Himself what He will not demand of Abraham. It is important on this day to simply be here to remember with power. We are quick to say that Jesus has died and then move on to Easter, not stopping and being there where it happened. So let us stop and be here, and reflect in silence on what God has done for us in His Son. The children of Israel (note they were never called the adults of Israel) are complaining about, you guessed it, the food. They got really personal about it too, doubting God and sassing Moses. So they certainly had it coming when the serpents slivered into camp with their names written on them. Naturally, they came running for help, given the bite of consequences. They never seemed to “get it” or at least the crowd that exited Egypt never got it. That is why only two of that generation made it to the Promised Land. It took wandering in circles for forty years for them to die off. Their children were a hardier lot. Seeing the cross coming and going and coming again. Jesus seeing his passion coming picked the story of the serpent on the pole as a metaphor for his coming death. This is called the type. However, this is a type only because what Jesus saw the striking similarity of the upward movement of the serpent on a pole and his body on a cross. This is called the Antitype. 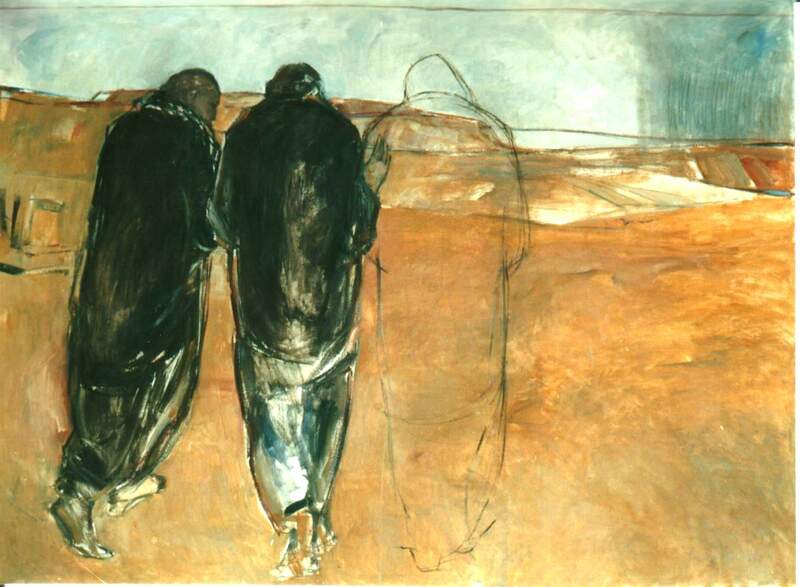 After Good Friday, the disciples saw the connection and realized that the incarnation (Jesus coming as a man) reflecting back and forth. Over time, they realized the New Testament as it developed, was concealed in the Old Testament and the Old Testament was revealed in the New Testament. • forward” (New Testament again with greater insight. For God so loved the world that he gave his only begotten son, so that everyone who believes in Him may not perish but may have eternal life. Let’s examine two words that are often misunderstood. Belief is not an affirmation of facts and data. Belief here is internalizing the truth perceived, evidenced by the reordering of our loves. Eternal life is not endless chronology. An old movie device for the passage of time was a calendar with leaves for each day set upon by a fan. The days flipped by and then moving faster and faster, years and decades. Calendar leaves blown by gale force winds in perpetuity is not eternal life. Eternal life is the quality of time, transcending the clock. The eternal is the quality of reality outside time and space. Since we have never been outside either, we cannot conceive it (yet). Some people are incapable of going to hell, because they are living there already in this present time. In the same way, eternal life begins now. Take heart. God is not like us! Moses did not hoist the serpent in the wilderness to taunt the Children of Israel with the image of the punishment they had earned by doubting God and sassing Moses. That is not how God works. 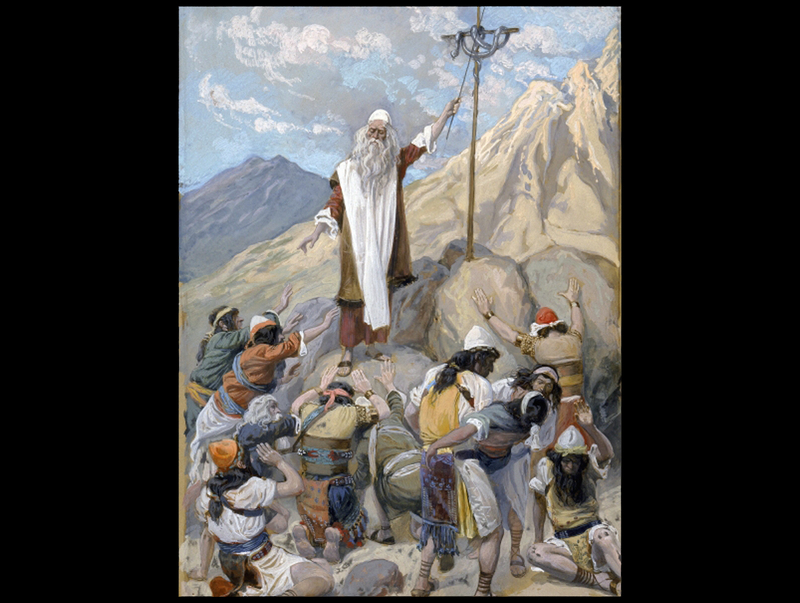 Moses, not being God, was tempted to go that route a few times, but was, to his credit, mostly restrained. The serpentine image was a sign of and a source of healing and salvation. All this when the Children of Israel clearly had it coming. Jesus was not lifted up to shame or pronounce judgment on the sinful and uninformed there that Passover. No, so that everyone who accepts the improbable good news of saving from the pandemic of sin, always fatal. Bizarre as it seems it makes perfect sense with the mind of faith. Don’t just do something today, stand there. Gaze upon the inoculation from death. Is this not wondrous, O my soul? Is this not wondrous, beloved to your soul? Salvation is the free gift of God to sinners; in Christ, man is given union with God even though he crucifies it. We are saved through faith in this gift, and through gratitude for it perform good works. Alan Watts – Behold the Spirit: A Study in the Necessity of Mystical Religion (p. 198). In this post-Christendom where we find ourselves, we no longer have the luxury of an unexamined and lazy spirituality. Now, we simply must know better. That being the case, let us live like it, being in constant prayer. What is ours in Christ Jesus is a gift. But finally it is a gift we must act on and live in. Lent will soon end. Easter is coming. When Saint Paul exhorts us to live in the power of the resurrection, it is not just a metaphor for moral living Life. Saint Paul means it literally. In this, we must be literalists! God called Abraham to follow him to the land of Canaan where God will make Abraham the father of a great nation. He went. “God promised him a covenant – a contract – God will, according to the contract, make Abraham, as he will be known, the ancestor of a multitude, not of people, but a multitude of nations. God will make Sarah, as she will be known, the mother of nations. Abraham was almost a hundred & Sarah almost 90. Romans 4:13 [page 118 NRSV] 13 For the promise that he would inherit the world did not come to Abraham or to his descendants through the law but through the righteousness of faith. 23Now the words, ‘it was reckoned to him’, were written not for his sake alone, 24but for ours also. It will be reckoned to us who believe in him who raised Jesus our Lord from the dead, 25who was handed over to death for our trespasses and was raised for our justification. Peter is horrified on at least two levels. On a thinking level, the idea of a “suffering” messiah was not part of the Jewish vision. Messiah was going to be like David, who would come and sweep the Romans into the sea, reestablishing the Jewish political state. Messiah was to be a King, a man’s man. The possibility of suffering was not at all what Peter had counted on. On a feeling level the notion that Jesus might suffer and die is emotionally painful. We say, “Don’t say that when someone voices a bad possibility as if by the mere saying it would make it happen. I perceive that you & I are very much like Peter. In America & the West we are at the end of an amazing ride, a ride that has gone on for over a century. Never in human history has so much been available to so many, continued and sustained for such a long time. As Immersed as I was in the 20th century, I thought that the word “Modern” simply meant new, improved, progressive, innovative, and inexorable even. Imagine my vertigo when I was introduced to the post-modern era. All that looked shiny and inevitable, you know modern, is now rusty, creaky, longer holding the promise upon which our culture relied. The greatest modern notion, the myth of inevitable progress, has failed us. We don’t want to hear that. It can’t be true. Why, because this is not how one follows Jesus! Beloved satisfaction is no longer immediate. Beloved we are not entitled to satisfaction. Beloved we have lived in illusion that we are entitled to immediate satisfaction. Jesus promised his followers only three things that they would be absurdly happy, entirely free and always in trouble. ISIS announced the execution of 21 Copts but only 20 names were confirmed, most of them were from the province of Minya (Upper Egypt). 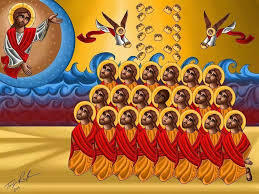 There was an inaccuracy in the number of Egyptian hostages; there were only 20 Egyptians (Copts). Then who was this remaining one non-Coptic victim? so the terrorist beheaded him also. What if Samuel Wilson was imprisoned with 20 of us? Would he have wanted what we have been given in Christ Jesus? Do we even know what we have in Christ Jesus? When Jesus said the way of the cross is the way of life, he wasn’t kidding. He meant it literally. To him, be glory and may the souls of the martyrs of Libya and of all the faithful, rest in peace. This young man got more than he expected on that Good Friday hunt. He became a priest and then a bishop and followed Jesus as a hunter of Men. Esau was a hairy man’s man – a mighty hunter – a Bubba – with gun-racks (or in this case bow-racks) on his chariot. Jacob was a momma’s boy – staying at home reading cook books, while there is nothing wrong with cooking and many of the great chefs are male, the little brother has not yet begun to move from the nurture of childhood into the journey toward man-hood. Esau and Jacob are the twin issues of men not leaving home and not growing up AND leaving home but not growing up either. This hunting metaphor becomes the metaphor of evangelism. While hunting and feeding on the animal becomes the language of sacrament, “behold the lamb of God that takes away the sins of the world” AND Jesus’ admonition, “eat my body and drink my blood” has been practiced by Christians ever since. In matters of faith as in nutrition you are what you eat. He goes out to see Jesus and he is a little man so the crowd no doubt made sure he couldn’t see (the sort of petty revenge taken by the weak on the powerful). But Zac didn’t get where he was because of his dignity or passivity so he shinnied up a sycamore tree. As Jesus came along he looked up and realized that he has treed something or this case someone. Jesus said, “Zacchaeus, come on down, I’m inviting myself and a bunch of my closest friends to lunch.” The text doesn’t record the reaction of Mrs. Zacchaeus when her husband showed up with all those strangers. After lunch, Zacchaeus – I will give half of all I have to the poor and if I have defrauded anyone [of course he had], I will pay them four times as much. You see that when you are hunted and treed by Jesus things change, they change for the better and they they change in a hurry. In 1492 Columbus set sail to the west to find the orient only to run into the Americas, and in that case for the explorer, as the tax-collector in Jericho, what he found turned out to be better than what he was looking for. Pausing, looking back toward where the story began there is symmetry, a type–antitype. 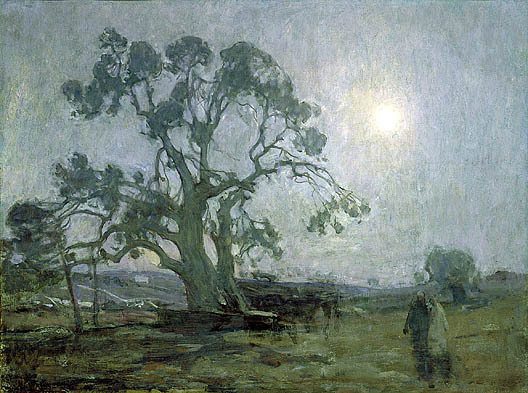 The place God began his self-revelation was at Mamre, which wasn’t much even then except for one world-class oak, In fact the place was known as the Oak of Mamre as the tree gave it about its only reason for being. God and two archangels some say or perhaps God, the Trinity, dropped by for lunch with Abraham and his wife Sarah. Since most have not seen an archangel and no one at all has seen the Trinity, it’s a little hard to know where one left off and the other began. It is safe to say that neither wife nor husband recognized their guests until all was revealed over lunch. Abraham bent over backwards showing hospitality that day and Sarah would have baked a cake if they had given her warning. The holy ones gravely accepted Abraham’s spread under the spreading branches and then got on to the business at hand. You know how it turned out of course. The childless couple had a boy come new-year and Sodom and environs became the Dead Sea by year end. Turning toward home, see the script? 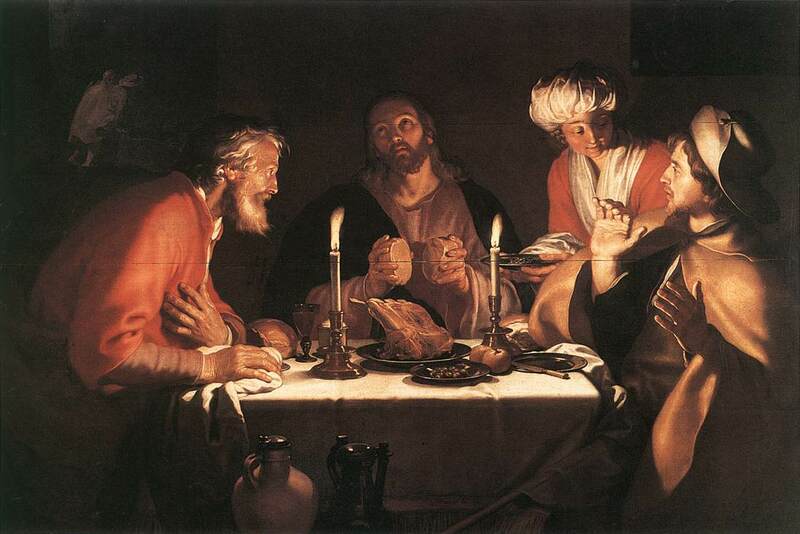 Cleopas and his companion are running away from home and bump into Jesus and then it all becomes clearer over supper. Both stories come to the moment of insight because of hospitality. Extending ourselves in service of the comfort and welcome of the stranger will often lead to gifts unforeseen. Do not neglect hospitality for some have entertained angels unawares. So you never know who might put their wingtips under your table, either expensive shoes or feathers. Prepare to hear the good news. 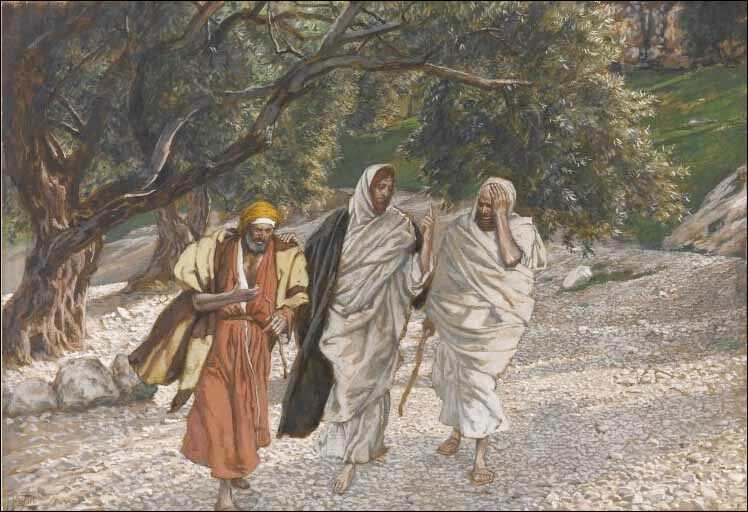 Jesus came near Cleopas and his un-named companion on the road from Jerusalem and Emmaus. Let’s get the actors straight on our program before we get confused. Hegsippus (early historian) records that Cleopas was the brother of Joseph the husband of Mary and step-father of Jesus our Lords. His companion may have been his son, Simeon. who became bishop after James, Jesus’ brother, was martyred? Cleopas and company are running away from the scene of the crime. Their deepest hopes have become their deepest wounds. There is no one more cynical than a deeply wounded idealist. Their eyes were “held” so they did not recognize him. When they explain their distress, Jesus showed them, beginning with Moses and so showed them that another way to read and understand the Scriptures was exactly what happened to Jesus. Thus he reframed their history and made bad news into good news. Anyone who has lived for very long has come to know that sometimes the only thing worse than the disappointment of not getting what we want is the remorse of getting exactly the thing longed for only to learn how bad it was for us and our souls. Of course, hopefully we learn from the consequences of getting what we want. It may well be that our “wanter” is broken. Actually it has been since Adam at the apple. It may be that God knows better what we need and want than we do. 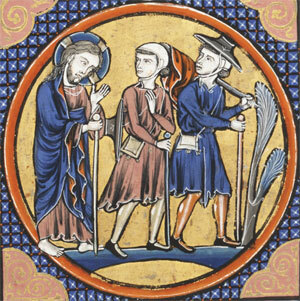 They come to Emmaus, perhaps to the family home, where Cleopas and his older brother Joseph were brought up. It was there it happened. They were sitting at the old family table, the very one that for all their lives on Friday they had the prayers and only the day after the Passover Supper where again they had eaten and told the story of rescue, how God brought them out of Egypt into the promised land and where they hoped for Messiah, the anointed one of God. Here Jesus did what is always done at this table, all Christian tables, at this service of Holy Thanksgiving. The four movements of the Eucharist, He took, he blessed, broke and gave. In reply to Satan who suggested he turn loaf-shaped stones into bread Jesus said, “Man does not live by bread alone.” Of course he doesn’t live without it either. In the only story told by all four Gospels (other than the passion) Jesus took a lunch of 5 loaves and 2 fish and fed 5000 people. If Jesus is God, then he was on the ground floor when the Universe began and if you can make matter from scratch then he can stretch molecules of bread in hand. What folk should have learned that day was (and is), whatever we make truly available to Jesus can (and will) be used. In addition, we should have learned by now that when Jesus takes something (any old thing) it is transformed and it becomes enough..
Now, think of all the “castoffs” of our lives. . It is a hoot seeing what Jesus does when he up-cycles what we distain into something needful. Today, look around, take inventory and then offer what we find to Jesus. He can do more with less than anyone I have ever I have ever known. A couple makes promises and then is married but when they are blessed their relationship is filled with divine content. Having taken the bread, ordinary stuff to sustain life in the body, Jesus now makes the bread “different/holy” and it is no longer just bread, but, like Manna in the wilderness, it is the bread of Heaven. Blessing changes things. It changes relationships. It changes effect. It changes value. To be blessed by God gives dignity and worth. If we are worthless by all human standards not so with God, divine love and blessing creates value where none existed before. What we will give up, Jesus will take up. What Jesus takes up, he blesses as he did that day when the children came running to him. And what he blesses has merit and dignity if for no other reason, because he blessed them. If God can do that with ground wheat seed mixed with water and baked, what can God to our lives? The most solemn moment in any Eucharist is the “fraction” – the actual breaking of the bread. On a day with low humidity there is a discernible “cracking” sound heard through the room. In that moment we are confronted symbolically with the suffering of Christ. The rubric (stage direction) in the Prayer Book is, “The celebrant breaks the consecrated Bread. A period of silence is kept.” What can we do in face of his sacrifice other than be silent? I believe that the breaking of the bread is all the broken things in our lives, our souls and bodies, those things done, those things left undone, are all (everyone) broken there as well. It is a good breaking, like re-breaking a leg that was inadequately set, in service of fullness of life. What Jesus’ taking, blessing and breaking make, he gives. It is food. It is life. It is healing. It is celebration and it is joy. Above all it is Viaticum, literally “food for the journey.” That which God requires of us, God in grace provides us. We need not grow hungry, forced to eat fast-food along the shoulder of the road. Lest we succumb to the junk-food at the Jiffy Mart, Jesus provides us nourishment such that we will arrive prepared to do what needs doing. When we come for “solace only, and not for strength; for pardon only, and not for renewal;” (BCP. Page 372) then we miss the best part. And what is the best part, you ask? Why, the best part is going out and doing what Jesus said for us to do and seeing that indeed it is happening. What’s not to like? Join a ministry team and find out. These are the four movements of the Eucharist. Jesus gave them the bread, they eyes were no longer “held” and they recognized him. Then he vanished. 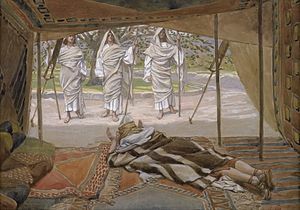 Then, no longer tired; (interesting how that happens) Cleopas and company marched immediately from Emmaus back to Jerusalem with the news of Jesus’ resurrection. Upon arriving they discover that the risen Christ has been busy and there afore them. Our hearts burned as he reframed the scriptures to include Messiah’s “failure” death upon a tree, they marveled. It’s really a simple matter, you see. Their unconscious got it even if their eyes were “held” and the same, beloved, is true in our own day. 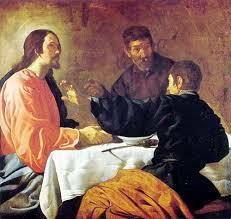 Ever since Emmaus, Christians know that Jesus shows up when the bread is broken. We don’t have to see him with our physical eyes. Our hearts will tell us even when our eyes fail us. Pay attention to the awaking fascinations of your soul. The soul turns unconsciously to God, as sunflowers follow the sun. .
His head upon a stone. Though he sleeps through the night. Walk up and down the stairs. Make graceful all they do. By which this sight can live? And so a man afraid. Is the household of God.